Wood garage doors range from midprice to very expensive, depending on whether they consist of a lightweight wooden frame filled with foam insulation and wrapped in a plywood or hardboard skin (the least expensive) or are true frame-and-panel doors made of durable mahogany, redwood, or cedar. Wood doors usually carry a short warranty, perhaps only one year. Aluminum: Inexpensive aluminum garage doors, once common, have largely been replaced by sturdy versions with heavy-duty extruded frames and dent-resistant laminated panels. 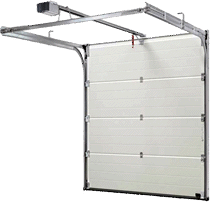 Rugged and rust-proof, these are a wonderful choice — if you can spend $10,000 or so on a garage doors. Considering the size of a garage doors, it might seem obvious that you should invest in one that’s insulated. Because of its sandwich construction, an insulated door is more durable, and the enclosed back panel gives a garage interior a more finished look.